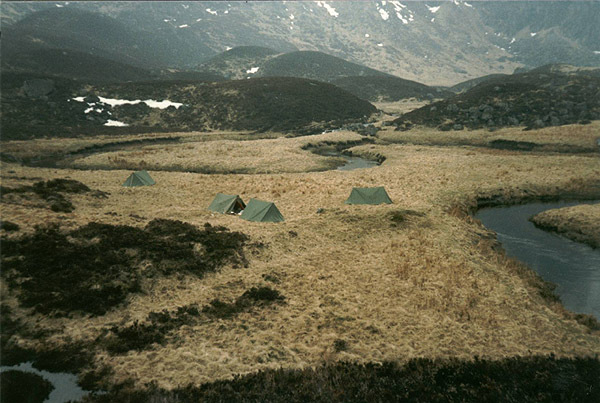 For many hillwalkers the neighbouring peaks of Driesh and Mayar were ticked off early on in the pursuit of high ground. But the pair have a lot more to offer besides the breaking in of boots. Sitting at the head of Glen Clova, they possess prominent vantage points from where a panorama of rolling upland scenery unfolds, with views beyond the Sidlaws to the Lomond Hills in Fife and, to the north, Lochnagar. The climb is straightforward if strenuous in places and, for those with a passion for flora and fauna, the route passes through the Caenlochan nature reserve with its rich variety of mountain plants. Leave the car park, turn right and follow the minor road up towards Acharn Farm and Glendoll Lodge, formerly a youth hostel. When you reach the farm, the track forks, the right hand option leading to the lodge. Take the left option, following forest walk signs. A short way on, pass through a kissing gate and carry straight on along the track, through a mix of deciduous and conifer trees. When the forest road reaches a junction, go left and the way crosses a bridge over a burn and curves round to another junction a short walk on. Ignore the track on the left and a path on the right and go straight on, bearing right and climbing through trees at an even gradient. The woodland is dominated by Scots Pine, but the occasional silver birch has been thrown in to add a tint of colour to the blanket of green. Very soon the track curves left, turning back on itself, and it is at this point that you join the Kilbo Path, and ancient right of way linking Glen Clova and Glen Prosen over the hills. The way rises steadily through a narrow passage in the trees, exposed roots clinging to the path like gnarled fingers gripping at the earth below. Several small streams are spanned before the way crosses the Burn of Kilbo at stepping stones near the top edge of the plantation. You emerge in to open hillside beyond a tall kissing gate and vistas unfold over the wooded slopes of Glen Doll. The Kilbo Path stretches ahead, cutting a clear course over the heather and blueberry bush-covered east side of the Shank of Drumfollow. Walk up towards the col and, just before it is reached, bear left on a narrow path cutting across the broad shoulder to the base of the final stretch of ascent of 947 metre-high Driesh. The way climbs over a stone-strewn hillside, following a line of fence posts to the summit, where the trig point is encircled by a shelter of rocks. Moving on to Mayar, head west, down to the col at the top of the Shank of Drumfollow to rejoin the Kilbo Path. Go left and follow the old right of way as it rises gently over the broad rolling shoulder linking Driesh with Mayar, the slightly shorter of the pair at 928 metres high. The path makes a sharp left turn just under a kilometre on from the col, at a sign post pointing the way down to Glen Prosen. Leave it at this point and carry straight up on to Mayar, a short section of ascent leading to the summit cairn. 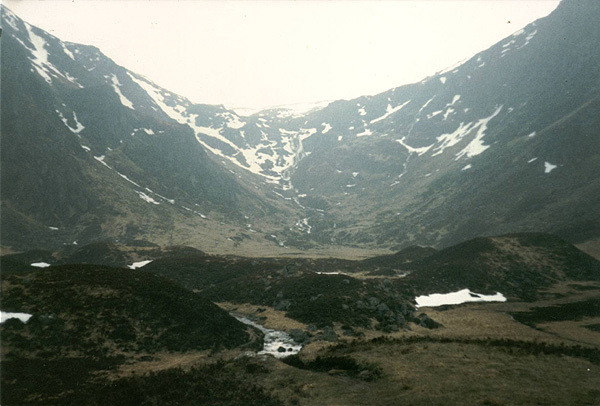 There are two ways to return home from here - either retrace your steps back to the Kilbo Path and follow it down to Glen Doll, or descend into Coire Fee. The latter is best done by heading north-west off Mayar, following a line of fence posts down over the hillside. When these turn sharp left, go right and walk across open hillside, through peat hags to meet the Fee Burn. Bear right and follow this downstream. Keep the burn between five and 10 metres away to your left to avoid some steep, rocky sections next to the exuberant flow and head down the glen, picking up an obvious path just below a couple of quirky waterfalls. The path drops to the flat base of the glen, passing a spectacular white tail of water lower down, and follows the weaving burn to the edge of the forest. Cross a stile here and the way negotiates trees and some boggy ground to meet up with a wide forest track. At the first junction you come to, don't go left but carry straight on and the track will lead you back to the car park. Start/parking Forestry Commission Glen Doll car park at the end of the public road. GR: NO 284762. A parking charge is levied. Grading Uncomplicated upland hike on to two Munros with paths for all but a short section. Suitable for fit walkers and teenage children. There are one or two steep sections on the descent into Coire Fee where great care must be taken.